"Nick, you really are impossible. You want too much. It's like flying in the face of God, as Mother used to say. 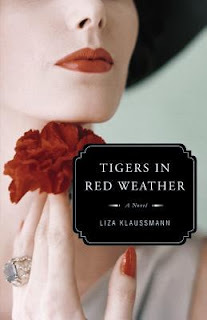 Synopsis Tigers in Red Weather by Liza Klaussmann*: Nick and her cousin, Helena, have grown up sharing sultry summer heat, sunbleached boat docks, and midnight gin parties on Martha's Vineyard in a glorious old family estate known as Tiger House. In the days following the end of the Second World War, the world seems to offer itself up, and the two women are on the cusp of their 'real lives': Helena is off to Hollywood and a new marriage, while Nick is heading for a reunion with her own young husband, Hughes, about to return from the war. Soon the gilt begins to crack. Helena's husband is not the man he seemed to be, and Hughes has returned from the war distant, his inner light curtained over. On the brink of the 1960s, back at Tiger House, Nick and Helena--with their children, Daisy and Ed--try to recapture that sense of possibility. But when Daisy and Ed discover the victim of a brutal murder, the intrusion of violence causes everything to unravel. The members of the family spin out of their prescribed orbits, secrets come to light, and nothing about their lives will ever be the same. Brilliantly told from five points of view, with a magical elegance and suspenseful dark longing, Tigers in Red Weather is an unforgettable debut novel from a writer of extraordinary insight and accomplishment. Another old favourite that I enjoyed in 2012, a debut novel by Liza Klaussmann. Here's my review. I enjoyed Klaussmann's writing so much that I also read her Villa America last year. A little bit of trivia: did you know that Klaussmann is the great-great-great granddaughter of Herman Melville!